We help senior veterans, their spouses, and their families understand what long term care benefits are available from the Department of Veterans Affairs (VA). Most people are not aware of the many benefits available through veterans health care, state veterans homes, home renovation grants (HISA Grants), or from two disability income programs called Compensation and Pension. One particular program called Veterans Pension, or more commonly known as the Veterans "Aid and Attendance Benefit", can provide money to help offset long-term care costs either in home, at an assisted living facility or skilled nursing facility. The Aid and Attendance Pension Benefit can even be used to pay a child to provide care at home. The reason for using "aid and attendance" to refer to Pension is that many veterans or their single surviving spouses can become eligible if they have a regular need for the aid or attendance of a caregiver or if they are housebound. Evidence of this need for care must be certified by VA as a "rating." With a rating, certain veterans or their surviving spouses can now qualify for Pension. Pension is also available to low income veteran households without a rating, but it is a lesser dollar amount. Proudly serving all of Florida, New York, New Jersey, Maryland, Virginia, and Massachusetts. 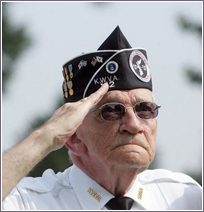 To receive Pension, a veteran must have served on active duty, at least 90 days, during a period of war. The veteran must be discharged under other than dishonorable conditions. Single surviving spouses of such veterans are also eligible. If younger than 65, the veteran must be totally disabled. If age 65 and older, there is no requirement for disability. There is no disability requirement for a single surviving spouse. The veteran household cannot have income -- adjusted for unreimbursed medical expenses -- exceeding the Maximum Annual Pension Rate -- MAPR -- for that veteran's Pension income category. If the adjusted income exceeds MAPR, there is no benefit. If adjusted income is less than the MAPR, the veteran receives a Pension income that is equal to the difference between MAPR and the household income adjusted for unreimbursed medical expenses. The Pension income is calculated, based on 12 months of future household income, but paid monthly.